The GMB said chemicals that can cause cancerous tumors, birth defects and development disorders will be allowed in the EU after the controversial trade agreement is signed. The union’s top health and safety officer expressed concern that TTIP would allow a “downward harmonization of standards” for chemicals currently banned in the EU. In separate comments, GMB called for the UK to ensure the National Health Service (NHS) is protected from private companies if the trade deal goes ahead. The European Parliament will vote on TTIP on Wednesday June 10, having already passed a non-binding resolution in favor of the trade agreement last month. Proponents of TTIP say the deal to remove trade barriers between the EU and US will drive growth and create jobs. 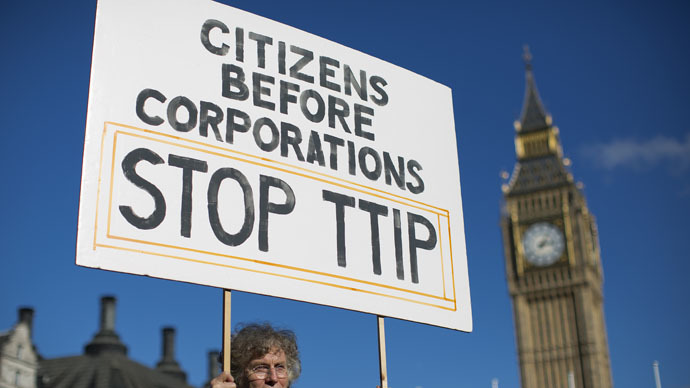 Research shows that TTIP could inject €120 billion into the EU’s economy, the European Commission claims. However, critics argue that the agreement, which has been negotiated behind closed doors, will weaken the EU’s health and safety regulations. They also warn it will enable private companies to sue governments over laws that limit their operations through a controversial investor-state dispute settlement (ISDS) clause. McClean warned that if TTIP is passed next week, it could open the door to harmful endocrine-disrupting chemicals (EDCs). “EDC's are chemicals, which, in certain doses, can interfere with the hormone system in animals, including humans,” he said. McClean said the US made clear from the outset of negotiations they would not adhere to the EU’s chemical standards, known as REACH. “This includes a range of regulations on paints, aiming dyes, sprays, cleaning products, garden/agricultural products – the range is vast. “This includes cosmetics which are the subject of specific EU laws as well. These regulations are to protect workers, consumers as well as the environment and animals,” McClean said. In a separate statement Thursday, the GMB called on the UK to negotiate an opt-out from the ISDS clause to ensure the NHS stays in the public sector. Campaigners fear the NHS could be the target of lawsuits from private corporations filed in commercial courts. Next week’s vote on TTIP hangs in the balance after the European Parliament’s Socialists and Democrats (S&D) group backed away from a deal with the center-right European People’s Party. The S&D group have reaffirmed their call to exclude the ISDS clause from the trade deal.